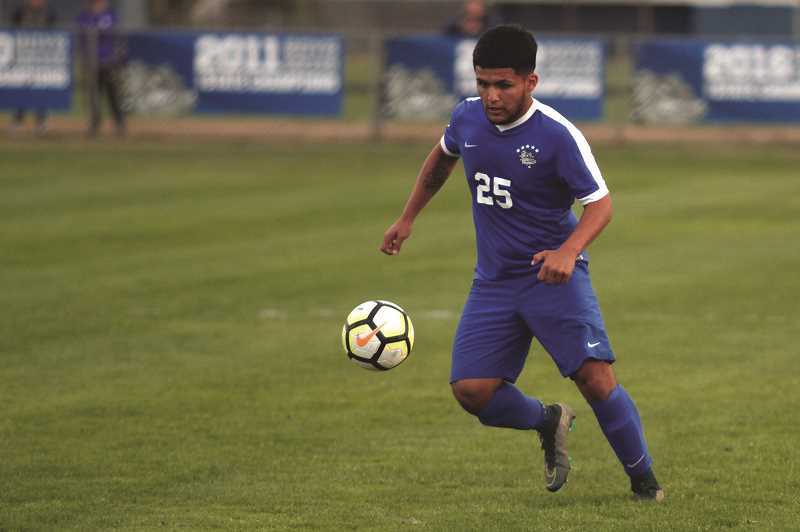 The Woodburn boys soccer team won its first Oregon West Conference title and secured home field advantage through the first two rounds of the state playoffs after defeating the Philomath Warriors 3-1 on Oct. 23 to finish the regular season. The No. 3 Bulldogs (13-1, 11-1 Oregon West) entered the final week of the regular season tied with No. 5 Stayton and poised to share the league title with the Eagles after the two teams split their season series. But the Eagles (11-2, 10-2 Oregon West) stumbled in their regular season finale, falling 1-0 to Cascade (4-9-1, 4-7-1 Oregon West), handing the league title outright to the Bulldogs. Woodburn was scheduled to host the first round of the playoffs on Oct. 30 against the Mazama Vikings (8-5-1, 4-5-1 Skyline), who defeated the Tillamook Cheesemakers 4-0 in the play-in round to advance to the state playoffs. If the Bulldogs advance, they will host a quarterfinal game against either No. 11 Molalla (7-5-3, 6-2-2 Tri-Valley) or No. 6 Valley Catholic (11-3, 7-1 Cowapa) on Saturday at a time to be determined.